The 2014 PSOE leadership election, more formally the 2014 Extraordinary PSOE Federal Congress was held between 26 and 27 July 2014 to ratify a new party Secretary General, with a preliminary primary election open to party members initially scheduled to be held on 13 July to elect the new party leader. The Congress was called by PSOE Secretary-General Alfredo Pérez Rubalcaba after his party's poor results at the 2014 European Parliament election, garnering just 23% of the vote. Rubalcaba announced his intention not to run for either his party's leadership or for the 2015 Spanish general election. This Federal Congress was the first held at a national level in which all party members and affiliates (around 200,000) had the possibility to be consulted, several days before the Congress was held, about which person they wanted to become the new party leader. While not a legally binding ballot, the results were likely to be respected by the 1,000 party delegates which finally elected the new party's Secretary-General. Party members wishing to contend the election were required to gather the endorsement of at least 5% of the party membership before June 27. The 2011 general election had resulted in a landslide victory for Mariano Rajoy's People's Party (PP), a result of the financial crisis which had been hurting the country's economy since 2008. The ruling Spanish Socialist Workers' Party (PSOE), amidst a climate of high unpopularity, was ousted from power with the worst election result since the first post-Francoist electoral process in 1977. Then-Prime Minister José Luis Rodríguez Zapatero had decided to stand down as PM candidate in early 2011 and as party leader once the quadrennial party congress due for early 2012 was held. Alfredo Pérez Rubalcaba, PSOE candidate for the 2011 election and former Deputy Prime Minister, was elected new Secretary-General in a tight fight against former Minister of Defence Carme Chacón. However, as the new Rajoy's government was forced to pass new austerity measures and spending cuts, including a harsh labor reform and a very austere state budget for 2012, the new Government's ratings plummeted in opinion polls as it met with widespread protests and two general strikes. Little over 6 months of government had seen support for the PP government plummet from 45% in the general election to 34% in mid-to late 2012 polls, the most support lost by a political party in its first months of government in the country's history. 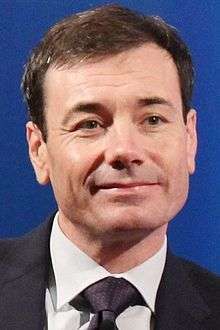 However, despite the PP's falling ratings, the PSOE found itself unable to regain lost support, suffering from the memory on Zapatero's last government and his economic management, as well as the emergence of major corruption scandals in both parties, regarding possible illegal financing on both the People's Party and the Socialist Party regional government of Andalusia. A series of negative regional election results throughout 2012, coupled with an internal crisis in 2013 and the threat of rupture from the party's Catalonia partner, the PSC, further weakened the PSOE, with Rubalcaba's leadership being put in question as his popularity ratings plummeted. The crisis was temporarily settled after the party's Political Conference in November 2013, with the question on the party's leadership being initially postponed for late 2014. After the European Parliament election, 2014 culminated in a major election crash for the party, coupled with a spectacular rise in support for newly-created Podemos party, Alfredo Pérez Rubalcaba announced his intention not to run as his party's candidate for the 2015 general election and to have the party hold an extraordinary Congress for July 2014. Though much speculation was made on party leaders contesting, such as former Minister of Defence and previous party contestant to the General Secretariat, Carme Chacón, or President of Andalusia, Susana Díaz, only three contesting candidates met the endorsement threshold. Poll results are listed in the tables below in reverse chronological order, showing the most recent first, and using the date the survey's fieldwork was done, as opposed to the date of publication. If such date is unknown, the date of publication is given instead. The highest percentage figure in each polling survey is displayed in bold, and the background shaded in the party's colour. In the instance that there is a tie, then no figure is shaded. 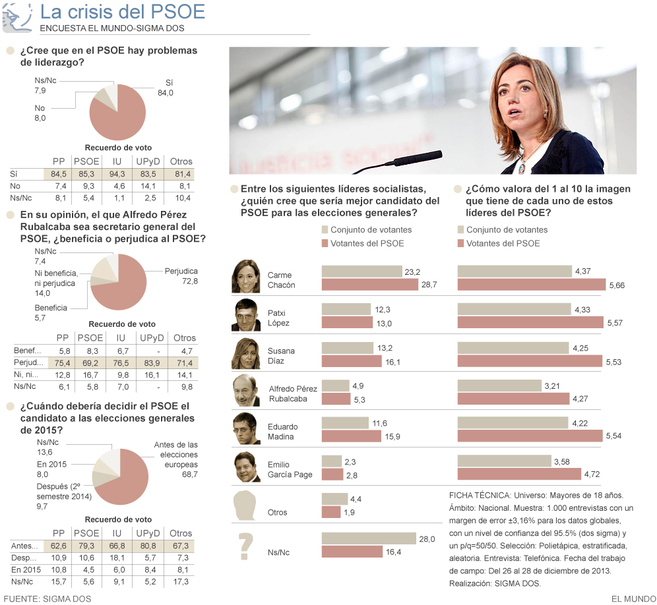 Polls show data gathered between PSOE voters/supporters. In his victory speech after being elected as Secretary-General by party members, Pedro Sánchez proclaimed "the beginning of a new time in the Spanish Socialist Workers' Party" and that it was "the beginning of the end of Mariano Rajoy [as Prime Minister]". He was formally named to the post on 26 July succeeding Rubalcaba, who announced his intention to quit from active politics and to return to his post professor in the Organic Chemistry faculty, in the Complutense University of Madrid. Upon his official proclamation as Secretary-General, Sánchez stated that "We [the PSOE] are the party of change, we are the left that will change Spain", urguing all Socialists to "work for the millions of people that need a renewed PSOE" and to make the party "the most formidable instrument for making the country progress". Sánchez promised to be blunt with corruption cases within the party, to look forward the promotion of a federal amendment of the Spanish Constitution and that his Executive will report in an open assembly to the militants once per year. Sánchez stated that he was inspired by the "modernization drives" of both Felipe González in the past as well as of PD-leader Matteo Renzi in Italy. ↑ "Rubalcaba throws the towel and calls an extraordinary congress for July after the debacle" (in Spanish). El País. 2014-05-26. ↑ "All party members will elect the future PSOE Secretary-General" (in Spanish). El País. 2014-05-30. ↑ "Rubalcaba promises a strong PSOE" (in Spanish). El País. 2012-02-05. ↑ "Rajoy approves the biggest spending cut in history and a large tax increase" (in Spanish). El País. 2011-12-31. ↑ "The reform eases and cheapens the dismissal" (in Spanish). El País. 2012-02-10. ↑ "29 March, general strike" (in Spanish). El Mundo. 2012-03-09. ↑ "Unions call a general strike for November 14" (in Spanish). El País. 2012-10-17. ↑ "The Government presents the state budget with a spending cut of 27.3 billion" (in Spanish). 20 Minutos. 2012-03-30. ↑ "Mas' challenge does not break Spain yet but opens a schism between PSOE and PSC" (in Spanish). El País. 2013-02-27. ↑ "Rubalcaba, to the drivers of Madina: "The PSOE is not on it"" (in Spanish). El Mundo. 2013-04-18. ↑ "PSOE leaders want Rubalcaba's dismissal now" (in Spanish). El Mundo. 2013-11-08. ↑ "Rubalcaba assured that "the PSOE has returned" and urges his people to go to the streets" (in Spanish). El País. 2013-11-10. ↑ "Rubalcaba throws in the towel and calls for an extraordinary party conference in July after the debacle" (in Spanish). El País. 2014-05-26. ↑ "Pérez Tapias presents his candidacy to the PSOE General Secretariat" (in Spanish). El Mundo. 2014-05-31. ↑ "Socialist Left will bring Pérez Tapias to lead the PSOE" (in Spanish). El País. 2014-05-31. ↑ "José Antonio Pérez Tapias will battle for the PSOE General Secretariat" (in Spanish). ABC. 2014-05-31. ↑ "Pedro Sánchez proclaims "it is the beginning of the end of Mariano Rajoy as Prime Minister"" (in Spanish). La Vanguardia. 2014-07-13. ↑ "Sánchez promises victory to PSOE" (in Spanish). El País. 2014-07-13. ↑ "New PSOE leader: "We are the left that will change Spain"" (in Spanish). El País. 2014-07-26. ↑ "Sánchez promises the PSOE a change 'from bottom to top'" (in Spanish). El Mundo. 2014-07-26. ↑ "Socialists move between Renzi and Valls" (in Spanish). El País. 2014-07-24.